Young Merlin discovers a magic mirror capable of altering a person’s destiny (amazon.com). Well, I suppose that isn’t much of a summary, but that is all there really is to this book. 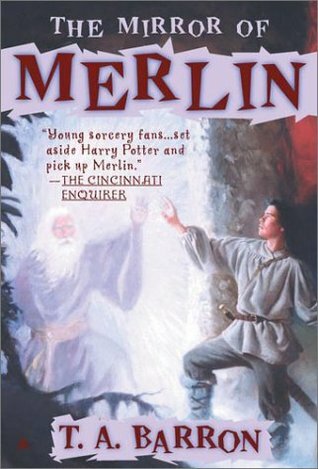 The Mirror of Merlin is the slowest of the series thus far. It wasn’t until about 150 pages into the book (only about a 250 page book) that things really began to happen. I just felt like this was a little slower than the plot should have moved. Maybe if something more important happened to Merlin at the beginning of the story it would have been more interesting. Basically, we just learn that he is trying to control his shadow, which he is having a hard time with and that his art of Leaping isn’t what it should be. Nonetheless, I stuck with it and am glad I did because the ending was pretty good. However, I can’t say to much about what happens in the last 100 pages besides saying that Merlin does find the mirror. I’m not going to say what he finds in the mirror or what happens at the end of the book, so if you want to know you will have to read other reviews (no spoilers!). I will say that this book contains the most about the Arthurian legend in its last 100 pages. I was really upset that Rhia wasn’t in this book. I really liked her character and thought it would have been more interesting to have her along than Hallia. I didn’t feel that Hallia served to much of a purpose in this novel other than telling Merlin about a great flaming tree in the center of the Marsh and showing him how to find it. She also isn’t anymore developed in this book than she was in the previous. We at least get to see her relationship with Merlin start to develop. The best thing was being able to see some more of the baby dragon! A new creature introduced in this novel was the ballymag. He is pretty much the traveling companion of Merlin and Hallia on their adventure within the Marsh. I didn’t really like him that well. His speech was just really strange and annoying, and other than knowing his way around the Marsh I would say he didn’t serve a purpose. I think Barron could have worked a little harder with this little creature to make him more adoring like Shim. I don’t want another Shim in a different creature, I just want the author to spend as much time developing these new creatures as he did with Shim. That’s what makes Shim such a good character in the first book. Oh well! Maybe you will like the ballymag! Anyway, I thought the book was pretty good. Just not as interesting or exciting as the others. I did enjoy the ending however, which bumped up my rating of the book. After reading all the others in the series you will want to read this as the ending of the book is important. Anyone who loves the series or who likes fantasy books should enjoy this book as well. Just be sure to read them in order!